Clean and Sophisticated: This 2017 White Kitchen Design Is Trendy Yet Timeless – Design Your Lifestyle. March 2017 March 2017 Peter Salerno, Inc. Thank you to the Peter Salerno Inc. Pinterest page for sharing its design photos used in this article. Since 2002, Peter Salerno Inc. is the most award-winning custom kitchen and bath design firm in North America. For more information about Peter Salerno, his company and his custom designs, please call (201) 251-6608. Our team at “Design Your Lifestyle” has been telling you for months that whites and neutrals CAN be the focal points of your new custom kitchen and bath designs for 2017. Well, consider these new design photos from award-winning designers Peter Salerno Inc. the proof! Peter Salerno Inc. 2017 new white kitchen design – stunning and trendy while using classic colors. This stunning 2017 kitchen design, aptly named “Clean and Sophisticated”, rests squarely on a palette of radiant white, rich Hazelnut dark neutrals and warm taupes. Of course, it’s easy to see that white dominates the discussion in this kitchen design – from the Maestro Rosolino custom cabinetry to the island countertop, the furniture to the custom range hood, the fireplace mantle to the decor (we love the decorative urns on the island), clean white is everywhere you look. Peter Salerno Inc. 2017 new white kitchen design – note the sleek curve on the custom sink and cabinets. The freshness of the clean white palette is emphasized by the sheer mass of pure ambient light that radiates in through the large windows. For such a large kitchen design, you’ll note the relatively minimal amount of lighting fixtures (two statement island lighting fixtures, some recessed lighting in the ceiling, a lamp and a chandelier). With the colossal trio of windows above the custom sink, countertop and cabinetry, this kitchen design will always see plenty of daylight. Peter Salerno Inc. 2017 new white kitchen design – extended view including gorgeous ceiling design. The Peter Salerno Inc. kitchen design extends into a lounge area, complete with fireplace and cozy, dark-neutral sectional sofa. We love the unique features of this lounge area, especially the use of a dark accent taupe on the fireplace wall. This “flips” the color scheme of the room at one end, by making two large white wall prints the accent instead of the feature. The fireplace mantle is smartly adorned with several statement pieces, and the outside patio door adds even more floor-to-ceiling ambient light to the room. Peter Salerno Inc. 2017 new white kitchen design – fireplace and lounge view featuring dark neutrals. With one final look at this gorgeous 2017 kitchen design, we notice the large custom hutch near the kitchen seating area. Also worth noting is the deep, rich tone of the kitchen island, and the light wood grain of the floor which mirrors the light taupe of the ceiling and pulls the entire kitchen design together. Peter Salerno Inc. 2017 new white kitchen design – one final look at this “timeless yet trendy” kitchen. Pingback: Snow Day Home Design Inspirations For 2017 – Design Your Lifestyle. 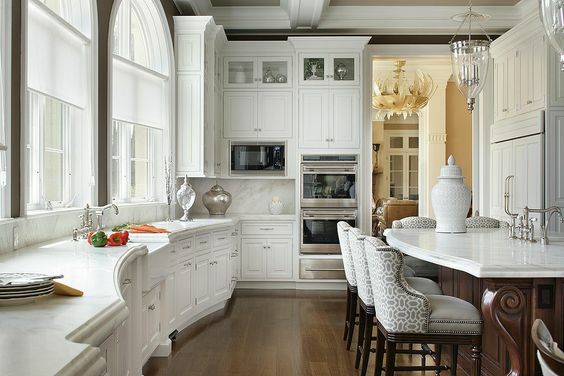 Pingback: 6 White Tones To Make Your Winter Kitchen Design Sparkle – Design Your Lifestyle.